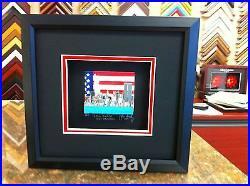 " And Our Flag was Still There " # / 450 EDITION Signed and numbered in Limited Edition (3-D) Construction by : JOHN SUCHY Image size is 2 3/4" x 3 1/2" Frame Size Approx 8 3/4" x 9 1/2". FRAMED IN A 1 INCH BLACK WOOD FRAME. MATTED IN A 2 INCH BLACK ACID FREE MAT. WITH A 1/4 INCH INNER COLOR ACID FREE MUSEUM MAT. 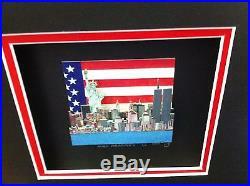 The item "John Suchy And Our Flag was Still There 3-D Art Signed & Numbered Rizzi" is in sale since Monday, August 15, 2016. This item is in the category "Art\Mixed Media Art & Collage Art".